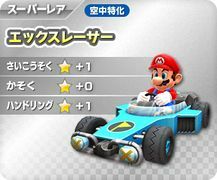 The X Racer is a light blue kart in Mario Kart Arcade GP DX, bearing some resemblance to a Formula One car. On the top of the front of the car is an emblem of the Special Flag. Its headlights have a yellow X on them. Its alternate colors are red and yellow. It is based off of the car from the Namco arcade game Rally-X. This page was last edited on March 6, 2018, at 19:04.